Known as "The Big O," Oscar Robertson is regarded as one of the greatest, most versatile players ever to play in the National Basketball Association (NBA). The Michael Jordan of his time, Robertson played guard for the Cincinnati Royals and the Milwaukee Bucks. By the time Robertson entered junior high school, his skills as a basketball player were already evident. As future professional teammate, Wayne Embry, told Terry Pluto in Tall Tales, "When Oscar Robertson walked into the ninth grade, he was a great player—not just for junior high, but for anywhere. The thing to remember about Oscar is that he was always great." field. However, high schools that were primarily white would not play Crispus Attucks because of racial prejudice. Despite such barriers, Robertson's high school team was dominant. The team won two state championships and once won 45 straight games. Robertson himself was named All-State three times, and many believed that he was the one of the best high school players in the country, if not the best. A number of All-American high school teams included Robertson's name. He attributed his success to grounding in fundamentals, in addition to his natural born talent and inborn basketball smarts. Robertson told Bob Herzog of Newsday that "When I was in high school, my coach told me I wouldn't play if I took a bad shot. So I never did. I worked for good position." In high school, Robertson was also academically gifted. At graduation, he was ranked 16 out of 171 in his class. Robertson was pursued by many colleges and universities for his basketball abilities. He wanted to play at his home state's Indiana University, but was not invited there because of the coach's racism. Instead, Robertson chose the University of Cincinnati, in part because it was close to his hometown. He was the first African-American to play on the school's basketball team, but did not play his freshman year (as was customary at the time). During Robertson's three active years with the Cincinnati Bearcats, he was dominant as a forward. He led scoring of the National Collegiate Athletic Association (NCAA) University Division each of those three years, averaging 33.8 points per game. Robertson was named a first team All-American three times as well. He was College Player of the Year in 1959 and 1960, the same years that the Bearcats reached the Final Four in NCAA tournament. As a senior, Robertson once scored 62 points in a game against North Texas State University. This was a record that lasted for almost three decades. 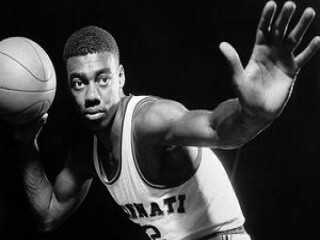 When Robertson graduated from the University of Cincinnati in 1960, he had set a new career scoring record for the NCAA University Division. Robertson had broken the previous record during his junior year, though it had taken the previous holder his whole career. Robertson's total was 2973 points, a record that held for a decade. Robertson had 14 total scoring records in his division. Despite such accomplishments, he endured much racial taunting while playing, especially at schools located in the south. Even Cincinnati was somewhat segregated: a restaurant located near the university did not serve African Americans. Still, Robertson graduated with his B.B.A. (Bachelor of Business Administration), despite racial problems and nearly flunking out at one point. After graduation, Robertson was selected to play on the United States basketball team in the 1960 Olympics. The games were held in Rome, Italy. Robertson was the captain of the team, averaging 17 points in each of the eight games played. The Americans swept the competition, winning the Gold Medal. Because of the way the National Basketball Association (NBA) constructed the draft at the time, Robertson was a territorial draft pick of the Cincinnati Royals. He was already well known by many players on the team because of his accomplishments with the University of Cincinnati Bearcats and because of pick-up games he played with some of the Royals' players. Robertson was moved from forward to guard, though some thought he was too tall for the position at 6 ′ 5 ″ . Instead, Robertson redefined the position, adding rebounding and other aspects and attitudes of forwards. He soon became known for his skills as a ball handler and passer. From his first year, Robertson was a dominant player, already possessing the skills needed to compete. Of his style as a player, Patricia Sellers and Andy Freeberg of Fortune wrote "He viewed basketball as a business, and he played it with precision and consistency, never with flamboyance or wasted motion." Robertson concurred, telling John Jackson of The Record "Basketball, to me, was to get the job done." He changed his game to what the team needed to win. Earning $22,000 per year, he averaged 30.5 points per game as a rookie and was named Rookie of the Year. Robertson was also named an All-NBA guard in 1960, beginning a string of nine straight years in which he received this honor. During the 1961-62 season, Robertson did something that no one has ever done again. He averaged a triple-double over the whole season, meaning that he had double figures in three areas—scoring (30.8 points), rebounding (12.5), and assists (11.4)—while playing an average of 44 minutes per game. This feat has never been matched. At the time, Robertson told John Jackson of The Record, "When I was making those triple doubles, I didn't know anything about that—and I didn't care. I was just on a team that was small up front and needed some rebounding help. I didn't think about it until after I got out of the game." Robertson almost accomplished this feat three other years as well. The best season of Robertson's career was 1963-64, when he averaged 31.4 points per game as well as 11 assists per game. Only Wilt Chamberlain scored more points that year, but it was Robertson who was named the NBA Player of the Year. The season was also remarkable for another reason: the beginning of the National Basketball Players Association, the players' union. During the All-Star Game, Robertson and several of the other best players in the league threatened to boycott the game before it began. They refused to leave the dressing room until the matter was settled. The players wanted to have a lawyer represent them at collective bargaining negotiations, while the team owners did not want them to have legal representation. Management gave in just before the game began. Some time later, Robertson served a term as the president of the National Basketball Players Association. In 1969, Cincinnati traded Robertson to the Milwaukee Bucks for Charlie Paulk and Flynn Robinson. At Milwaukee Robertson played with future superstar Lew Alcindor (later known as Kareem Abdul-Jabbar). In 1970-71, the Bucks won the NBA championship, the only championship Robertson ever won. The franchise was only in its third year. In 1971, Robertson was second to Wilt Chamberlain for the All-Time NBA Team voting. He had been twice named to the second all-NBA team by the end of his career, after being named to the first team ten times in a row. When Robertson retired in 1973, after 14 seasons, he had scored a total of 26,710 points, 7804 rebounds (a record at one time) and 9887 assists (an NBA record at the time). He also set a record for 7694 free throws. Over the course of his career, Robertson averaged 25.7 points and 9 assists per game. He appeared in the All-Star Game 12 times and was the game's Most Valuable Player three times (including two consecutive years). He led the league in assists for six seasons as well. However, his salary was never higher than $250,000 per season. The transition to life outside of basketball was hard for Robertson. He told Thomas Bonk of the Los Angeles Times in 1985, "Of course I had problems adjusting. I'm still adjusting. Players don't understand. They don't realize when they start playing basketball that it comes to an end." Robertson, like others, still had to make a living, though he had some preparation. He had made some real estate development investments while playing in the NBA. Robertson stayed with the game briefly by working as a broadcaster, the color analyst for games aired on ABC Sports Radio. Primarily, however, Robertson used his college degree to become a businessman in Cincinnati. In 1981, he founded Orchem (Oscar Robertson Chemical), a company that took four years to attain profitability. Orchem made specialty chemicals used to clean the equipment of companies such as Kraft, Pepsi and Anheuser-Busch. Robertson also owned Orpack (which manufactured corrugated boxes), a construction and trucking company. He was a spokesman for Pepsi at one point as well. Robertson's contributions to basketball were not forgotten. In 1979, he was easily elected to the Naismith Memorial Basketball Hall of Fame. Robertson was a unanimous selection in the first year he was eligible. The following year, he was named to the NBC's 35th Anniversary All-Time team, recognition of his prowess on the basketball court. In 1994, a nine-foot-high statue of him was elected at the University of Cincinnati, much to his embarrassment. His college exploits led Robertson to be honored by the United States Basketball Writers Association. They named their college player of the year award the Oscar Robertson Trophy in 1998. When the Associated Press chose the best player of the twentieth century, Robertson received the second most votes. Only Michael Jordan received more. Robertson was regarded as hero for another gift, one that he gave unselfishly. He was married to a former teacher, Yvonne Crittenden, with whom he had three daughters, Shana, Tia and Mari. In 1997, Robertson donated a kidney to save the life of his daughter Tia, who was suffering from lupus. Doctors had to remove a rib in order to reach the kidney, limiting his mobility for a while. There was much media interest in the event, though Robertson said he was doing what any father should. After this family trauma, he became involved with the National Lupus Foundation of America and the National Kidney Foundation. View the full website biography of Oscar Robertson.